The 4th of July is all about Freedom: the huge tea party in Boston Harbor that slaked nobody's thirst but instead got folks riled enough to say "enough!". And in small towns - at least here in upstate NY and the northern tier of PA - people take their 4th of July celebrations to heart. Just about every town has fireworks, a carnival down at the Legion field, and a parade down Main Street. 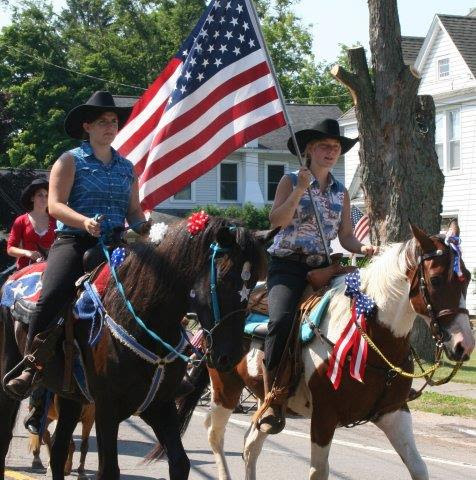 Small town 4th of July parades are great fun. The parade committee chooses a theme and neighbors get together to create floats. I've seen everything from flowery princesses to a pointedly political manure spreader. And everyone gets to participate. This year's parade theme is "Helping Your Neighbors" - a worthy theme given that the service clubs of Kiwanis, Lions, and Rotary are sponsoring and organizing the parade.So some neighbors who have been busy helping in the community were astounded when their float application was denied. 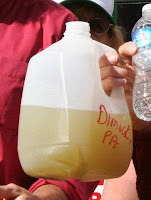 For the past two years, these neighbors have been delivering clean drinking water to people down the road in Dimock, who have been without drinking water due to nearby drilling. They washed and waxed their water delivery truck and wanted to decorate it with some banners to let people know the "Citizens for Clean Water" are actively "helping your neighbors". The problem seems to be that helping one's neighbors by providing fresh water is too controversial. But, hey - a couple thousand years ago the idea of feeding the hungry and clothing the poor was controversial. Given that our country was born of a protest movement, how did we come to this moment when only "acceptable" political opinions are allowed in a parade celebrating independence from tyranny? So this 4th of July you won't see people who have truly been helping their neighbors marching in the parade. They have been relegated to the sidelines, where they'll proudly stand with their signs and tell any and all how to get involved helping people in need. 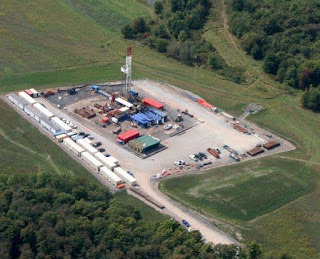 A new study out of Duke University, released today by the journal Proceedings of the National Academy of Sciences finds that people living closer to Marcellus gas wells have a higher chance of getting methane - and other chemicals - in their drinking water than people living farther away. This new study expands and confirms findings of an earlier Duke study two years ago. The team sampled 81 new drinking water wells in six northeastern Pennsylvania counties, and combined data with results from 60 previously sampled wells in PA and Otsego County, NY. Researchers found methane in drinking water of 82% of the 141 homes - and concentrations were six times higher in those homes that were within a kilometer of a gas well. A kilometer is 3280 feet. Currently, many gas companies test water wells within 1,000 feet of proposed gas wells. Clearly not far enough, given Duke's study. Not only did those homes have higher methane than "allowable" levels, but they also had higher levels of ethane and propane. These are components of the deep gas that shale gas drillers seek, not "biogenic" gas from upper layers. 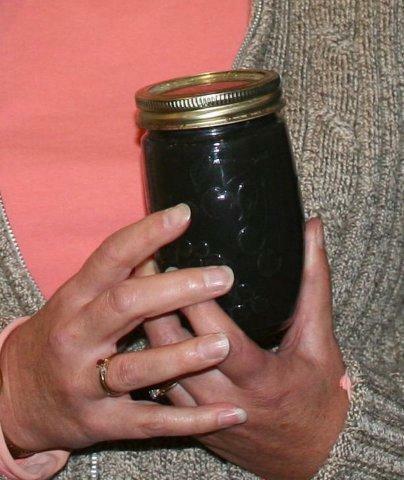 Tennessee Environmental Official Equates Citizen Concerns about Water Quality to "Terrorism"
might want to think twice before calling in a complaint to the the Tennessee Department of Environment and Conservation (TDEC). Last month Sherwin Smith, deputy director of TDEC's Division of Water Resources warned a group of Maury County residents that "unfounded complaints" about water quality could be "considered an act of terrorism". Seems that residents in Mount Pleasant have been complaining to the state's environmental agency for months that their children are getting ill from drinking the water. 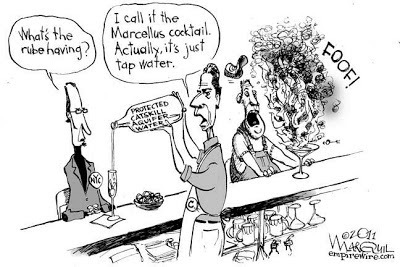 In a May 29 meeting Smith says, "...you need to make sure that when you make water quality complaints, you have a basis because, federally, if there's no water quality issues, that can be considered under homeland security an act of terrorism." You can hear audio recorded by Statewide Organizing for Community eMpowerment here. Needless to say, Mount Pleasant residents take a dim view of Smith's statements. They see it as intimidation and a continued lack of concern from the government they support with their tax dollars. You can read more about their long-standing attempts to get the dirty water problem solved here. When they're not dealing with sinkholes, Louisiana residents are avoiding explosions. 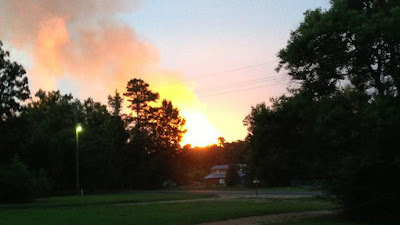 Early this morning residents in Washington Parish, LA - abut 80 miles from New Orleans - woke up to an explosion. 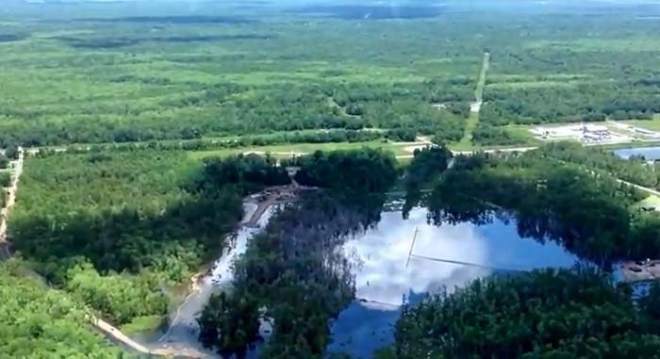 An 80-foot section of the Florida Gas Transmission pipeline (a 30-inch pipe) ruptured, leaving a huge crater and clay-baked earth. 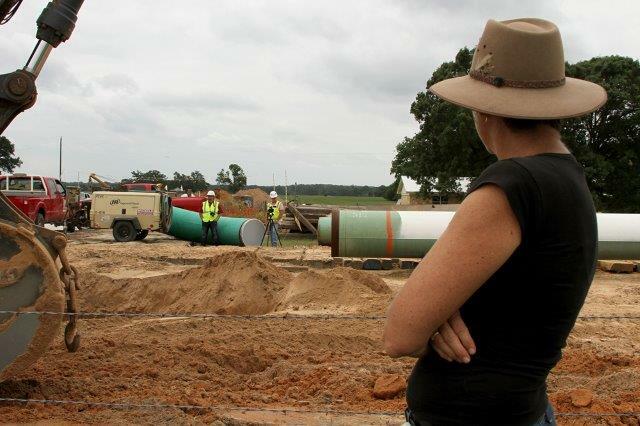 When it's not busted, the pipeline carries 3.1 billion cubic feet of gas from Texas to south Florida. The explosion happened in a rural area, and affected only one residence that was about 700 feet from the blast. The heat was so intense that it melted the siding off the pre-fab home. This is the third explosion in a week for Louisiana. Last Thursday there was an explosion at a chemical plant in Geismar that left two dead and about 100 injured. The following day there was another explosion at another chemical plant, this one in Donaldsonville, that left one dead and eight injured. In an effort to halt protest against Keystone XL pipeline, TransCanada corporation has taken to labeling protesters as "terrorists". In particular, they are targeting Nebraska citizens who have conducted peaceful, nonviolent protests - going so far as to hold "educational" sessions with local law enforcement on what the foreign corporation perceives as "terrorist threats". Let me repeat: a foreign corporation, that has used eminent domain to take land from ranchers (in TX and other places) is claiming that US citizens protesting their actions are "terrorists". The group Bold Nebraska used Freedom of Information requests to obtain documents TransCanada presented local law enforcement in an effort to portray law-abiding US citizens as a "threat". “When TransCanada said they had a right to forcibly take part of my family's farm for their Keystone Pipeline project, we knew it was time to stand and fight. TransCanada offered a paltry one-time sum, but as we have maintained, this is absolutely not about the money. This is our family saying no foreign corporation who appears to be building a project for their own financial gain should have more of a right to our land than we do. Because Julia has protested in a most lawful way, TransCanada has decided to use intimidation tactics: they pay a worker to film Julia at all times and send a helicopter over her land every few minutes to monitor her. Remember - this is not a government taking this action, but a corporation - and a foreign corporation at that. Senator David Carlucci introduced Senate bill 4046 that would prevent the commissioner of Environmental conservation from finalizing and publishing the revised Supplemental Generic Environmental Impact Statement (SGEIS) for at least 2 years - and requires completion of the EPA fracking study and health studies. Avella introduced Senate bill 673 which would amend the environmental conservation law by prohibiting hydraulic fracturing altogether and outlaw disposal and/or processing of any drilling fluids or drill cuttings in New York. That includes: drilling mud; chemical additives and frack fluid; flow back fluids returning to the surface after the hydraulic fracturing process; and any other residual liquids involved in drilling. 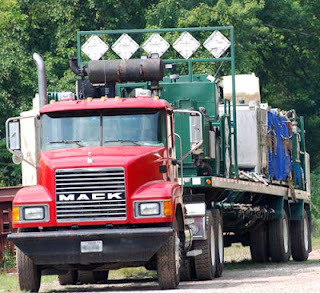 There are at least three bills that deal specifically with drilling wastes. Senate bill 674 would require hazardous wastes produced from oil and gas activities to be treated the same as hazardous wastes produced by other industries. 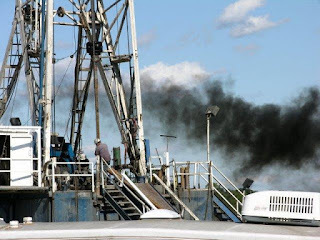 Currently, Department of Environmental Conservation (DEC) regulations exempt “drilling fluids, produced waters, and other wastes associated with the exploration, development or production of crude oil, natural gas or geothermal energy” from being regulated as hazardous waste. Senator Martin Dilan's bill (S 408) would prohibit radioactive or hazardous waste disposal or transfer stations from being sited within 1500 feet of school property. And just a month ago Senator Cecilia Tkaczyk introduced Senate bill 5123 that would prohibit the transportation of any waste product or byproduct from fracking operations. With less than two weeks left in the session it’s unlikely that any of these bills will be brought to a vote. Neither Avella nor Tom O’Mara, both of whom sit on the Senate Environmental Conservation Committee, responded to repeated requests for comments on why they’re keeping environmental legislation from reaching the floor. But Xavier San Miguel, director of communications for Avella, chalks it up to a pro-fracking Republican conference. “Dean Skelos and Jeff Kline control what comes to the floor for a vote, and they don’t seem inclined to promote these bills,” San Miguel said. And that seems odd, seeing how Kline is cosponsoring two of the bills. With 30 Republicans and 33 Democrats, one might think the Democrats could generate enough support to push these bills through. But back in December 2012, five Democrats formed an Independent Democratic conference and defected to join the Republicans, forming a coalition. They struck a deal allowing two leaders: Republican Dean Skelos and Democrat Jeff Klein. This move denied the traditional Democratic conference from taking majority control, and gives Skelos and Klein great power over which bills get a vote – and which bills get tossed under the frack truck. The sinkhole in Assumption Parish, LA has grown to a bit more than 15 acres now, and continues to cause trouble. Sometime between Monday night and Tuesday, the sinkhole swallowed a 400-500 foot section of the emergency containment levee put in place by the Texas Brine Co. This follows a week of tremors. According to news reports, the levee is still intact - it's just under four feet of water. This is the second time in nearly a month that subsidence has resulted in the containment levee being breached. The levee was designed to have a 20-year lifespan, but as residents pointed out to local reporters, so far it's lasted a few weeks at tops. Meanwhile, residents affected by the ever-growing sinkhole are still waiting for buy-outs from Texas Brine. You can watch a video taken during a state police flyover on June 4 here. 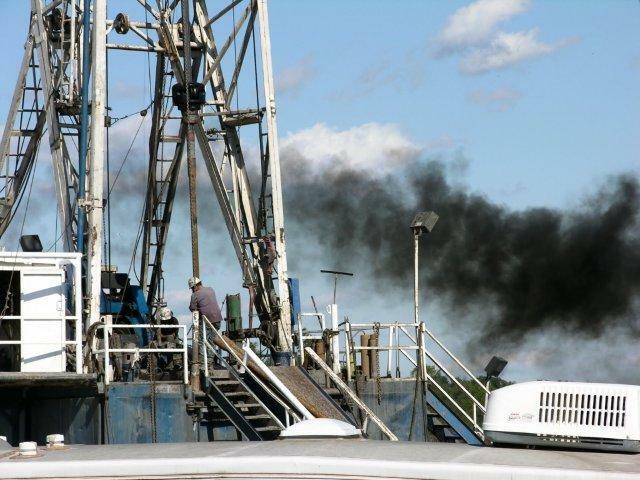 Can blood tests show the impacts of gas and oil drilling? That’s a question one Colorado doctor hopes to answer. Dr. John Hughes, of Aspen Integrative Medicine recently tested the blood of several Carbondale residents, according to a recent article in the Aspen Daily News. He tested ten people for a range of volatile organic compounds (VOCs) including benzene, toluene, ethylbenzene, and xylene – compounds found in air samples in many drilling areas. His preliminary results found low levels of xylene but, as reporter Nelson Harvey puts it, “no VOC concentrations above federal health thresholds”. It is Sunday - a day traditionally reserved for sprawling across the living room floor and reading the Sunday Comics and the Opinion Section. Remember those days - when a weekend wasn't complete without ink on your fingers or your silly putty? In that spirit I bring you a word from our sponsors - without whom I would have little to write about.